I'm Yours! No, Wait, I'm Yours! Bo, fortunately, is not the possessive or jealous type, so he just kind of hangs around while she shamelessly flirts with Rocky and Hawk. And sometimes, as you'll see, he hangs his head over Guadalupe in mid-flirt, as if to claim her as his own ... or maybe to remind her that, ahem, he's actually still here! 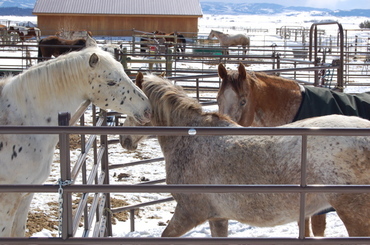 Bo is the equine version of the proverbial door-mat spouse, the endlessly forgiving type. In the photo at top, Rocky is cooing at her and Guadalupe is pawing the ground in anticipation of the candle-lit dinner to come. Please notice Guadalupe's tail up in the air. There's nothing coy about this. The fact that none of these blind boys can see her tail in the air doesn't matter one bit. Obviously. Spring is in the air. And love. If you can call it that. 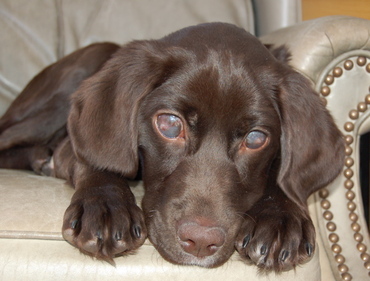 Here's the little guy we flew in from Mississippi on Thursday ... blind Creighton, a chocolate Lab puppy only four months old. He's actually a pretty big and lanky boy for his age, but he still has those tiny, sharp baby teeth and is 100% pure puppy. He is as sweet as he looks, too -- he's absolutely adorable. About two weeks ago, I received an email from a lady named Debbie L. who runs a poodle and small breed rescue group in Vicksburg, Mississippi. Debbie's e-mail had only one line in it. She wrote, "Please can you take this 4 month old puppy?" She was forwarding an email from another lady named Lindsey D. in Vicksburg, and attached were photos of the puppy with a horrendous set of bulging, bloodshot, ulcerated eyes. The story was simple but sad: A woman said her daughter had bought the AKC-registered puppy for her boyfriend, but didn't know the dog was blind. Daughter and boyfriend broke up, and boyfriend didn't want the puppy. Neither did the daughter. Thus the woman ended up with her daughter's "gift" and didn't want him either. A vet who knew Lindsey had a blind Pug put the woman in touch with her. Lindsey wasn't involved in rescue but knew Debbie, so she contacted Debbie for help in finding a home for the blind puppy. Hence the email to us. 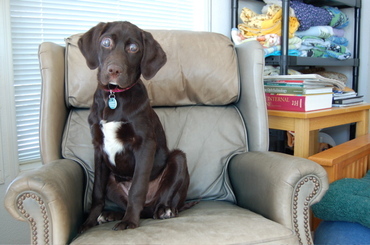 We took one look at those eyes and thought, oh dear -- this puppy needs medical care in the worst way. 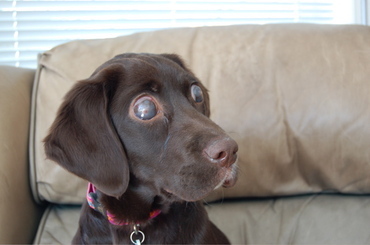 I had never seen a dog that young with eyes that looked that bad. 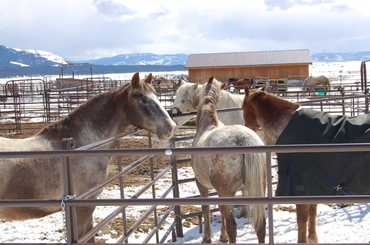 We agreed to take him, and began working with Lindsey on the logistics to get him to Montana. First, we arranged to get the puppy to a vet clinic in Vicksburg and boarded him there to keep him safe until we could fly him out. 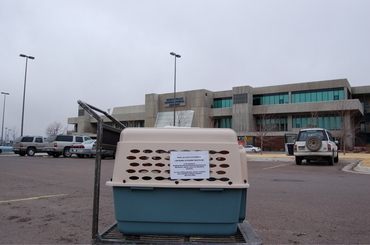 We sent Lindsey the money for a crate, and paid for Creighton's vet exam and other care at the clinic. I made the flight arrangements with Northwest Airlines to fly him from Jackson, Mississippi to Minneapolis on Wednesday, where he would overnight at a boarding kennel, and then fly on to Great Falls on Thursday. So on Wednesday, Lindsey left work early to pick up Creighton at the clinic and drive him to the airport in Jackson to start his journey to Montana. At first I couldn't get Creighton out of the crate, so I finally reached in, picked him up and pulled him out. Once Creighton realized he was outside, he suddenly became very excited and bouncy .. and then immediately peed all over my shoes. This was the first of many submissive urinations we've seen over the past few days, in fact. Even though he's excited to be petted and get attention, the moment he realizes we're approaching him, he starts piddling. Once we start petting him, he stops ... but something about being approached triggers it. Yet he's not at all a fearful, cringing puppy. Quite the opposite. He's happy and cheerful and jumps up and down to greet us, sometimes spinning in a complete 360-degree circle! Being a puppy, he veers from too-much energy to sound-asleep in five minutes. Creighton is sleeping on a bed here in my office as I write this, lying next to Ellie May. He's clearly a puppy that has had no training or manners taught by either people or other dogs, so his elders in the house are teaching him boundaries and what's acceptable play. The Dachshunds, of course, are teaching him to "@#%&! watch where you put your big feet, you lug!" Even Ellie May told him to mind his manners this afternoon, sounding like a gentle but firm headmistress with a wayward student. And oh, do those eyes hurt. When he walks into something, he yikes. They definitely look like multiple things have gone wrong, but all I can tell is they're painful. He has untreated old ulcers on each cornea, but they can't explain his blindness by themselves. His eyes bulge like he has glaucoma, but when I took his eye pressures on Friday, I got extremely low readings -- either the Tono-Pen is off, my technique is off, or there is something very weird going on inside those eyes. I'm taking him to see our vet, Brenda Culver, this week. The cost of Creighton's trip, including the overnight boarding fee, was $391.63. The bill for his stay at the vet clinic in Vicksburg was $232.50. And he is worth every penny. Thanks to Lindsey and Debbie in Mississippi for working so hard to save this little guy ... and thanks to all of the sanctuary's generous supporters, whose gifts make it possible for us to take in animals like Creighton. We couldn't do this without you. 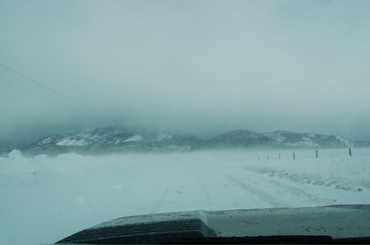 When I dropped off our spring newsletters at the Ovando Post Office last Wednesday, our postmaster joked that we should call this edition the "extended winter" issue. As you'll see from these photos I took today, there's a reason! 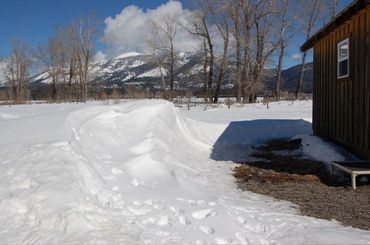 We've had a couple more snowstorms blow through in the past few days, adding a few more inches to the existing snowdrifts scattered around the ranch. It's hard to believe it really is springtime. 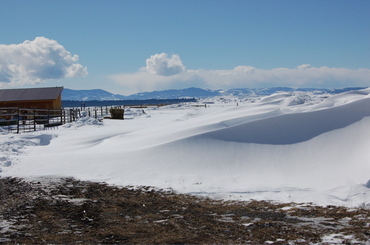 Now, don't get me wrong, we are actually delighted with the snowpack because of the drought-like conditions Montana has had over the past several years. 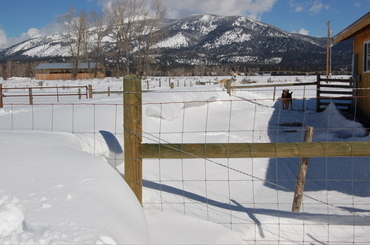 The longer the snow sticks around, the better it is for the pastures, for the aquifer, for irrigation, for fish in the rivers, and for fire suppression. But mentally, we are really ready to see bare ground again ... especially when it seems like everyone else within 10 miles of here actually does have bare ground! 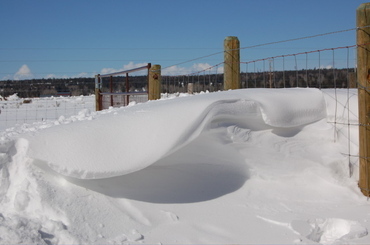 So for a blog bonus feature, I thought I'd take you on a brief tour of the ranch snowdrifts today. Some of these are rather amazing snow sculptures. The photo at the top is outside our front door on the west side of the house. Finally, here's a close-up of the same drift. 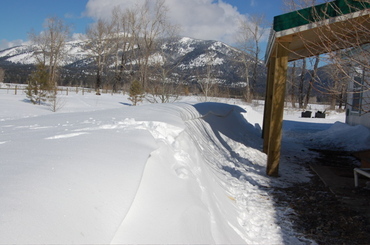 The tracks across the top belong to either Zephyr, Gloria's dog, or deaf Tyler, both of whom are able to see that they can just walk across the fences! 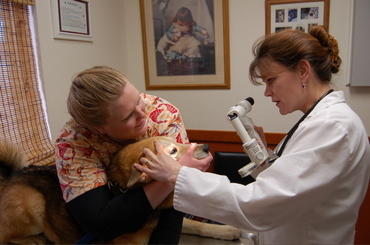 I drove Mitch the blind Husky to Helena today to see our vet, Dr. Brenda Culver, for an eye exam. I had suspected, based on the appearance of his eyes, that he had progressive retinal atrophy, or PRA. Brenda and I both like making educated guesses prior to the exam, simply based on visual appearance, and then letting her diagnostic tools tell us how accurate we are. 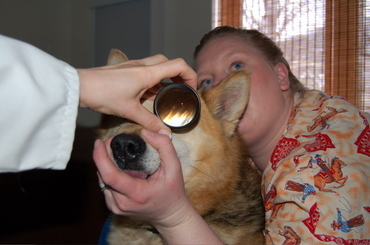 In the photo above, Brenda is using her slit lamp to look into his eye. Vet tech Jayme J. is holding Mitch still for the exam. 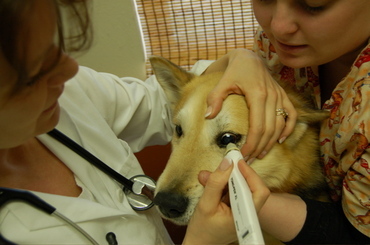 The slit lamp is an ophthalmic microscope, so you can see virtually everything going on inside the eye. After just a few seconds, Brenda turned to me and said, "He's got the most advanced case of PRA I think I've ever seen." The retinas were as thin as they could possibly be. So I left Mitch at the clinic to be neutered, and then drove north out of Helena towards Great Falls. I was headed to the airport there to meet a little blind guy we were flying in from Mississippi today ... a 4-month old Lab puppy named Creighton. He arrived safe and sound, but I'm going to save him for my Sunday night blog post! Stay tuned for Creighton's story and more photos! 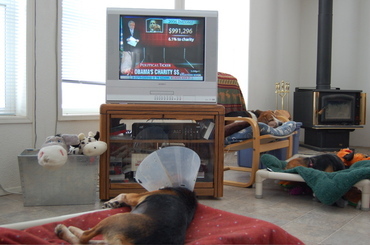 I walked out of my office late this afternoon and saw this scene in the living room ... blind Briggs parked in front of the TV, looking as if he were using his cone to get better satellite reception with CNN. And there are the other two Beagles, deaf Stuart on the chair and blind Widget on the cot. Not one of them was actually paying any attention to Wolf Blitzer's program. They may be hounds but they are definitely not, um, newshounds. Briggs continues to recover from his eye surgery, and his eyes still look pretty icky at this point. That cone has to stay on for quite a while. 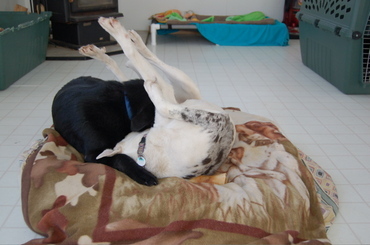 We were surprised to find another side of Briggs last week, after blind Mitch the Husky arrived. Mitch hasn't been neutered yet (off to the vet tomorrow! ), and Briggs was only recently neutered when he came a few weeks ago, so we're having a clash of the testosterones ... but it's all coming from Briggs, who obviously still has some of that stuff in his system! The first time Briggs realized Mitch was out in the yard, he got his hackles up, started barking, and went wobbling over to let Mitch know that he, Briggs, was the new sheriff in town. Briggs got so wound up over Mitch that his eyes started bulging ... and I mean bulging so much we thought they were going to pop right out of his head! We said to him, "Careful, dude, we paid for those eyes!" Now, bear in mind Mitch towers over this little blind Beagle, but Briggs was going to let him know just who was running the show around here. This was the strangest thing, because we had never seen Briggs like this before with any of our dogs. Now suddenly he was Mr. Tough Guy, laying down the law to the new Husky. Briggs will wobble forth to go nose-to-nose with Mitch, who looks down at this unsteady yet oddly assertive Beagle with the cone on his head and wonders how he should respond. Mitch is too sweet to get worked up over something like this, so he finally gives Briggs a dismissive look that says "What on earth are you?" and turns away. Of course, Briggs interprets this as a "win." A little testosterone goes a long way. 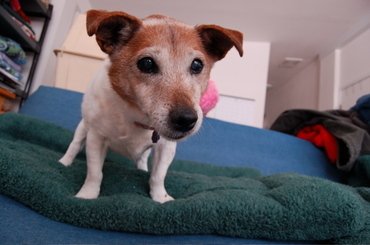 Here's Duchess, the little blind-and-deaf girl who arrived three weeks ago. Because she's ancient, we've started calling her Granny, and it fits her personality. She's just the sweetest thing, and every time we pick her up, she licks us on the face. But honestly, we didn't really know how she would adapt to this environment, going from living isolated in a garage for most of her life to a high-energy household full of dogs and constant activity. 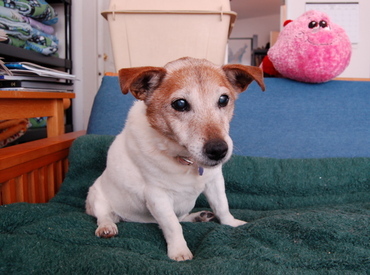 That can be a difficult adjustment for any old dog, but when you consider she is totally blind and deaf, and never lived with other dogs, we had to wonder what it would be like for her. In a phrase: piece of cake. Actually, I should say: piece of bread, because that is her favorite thing in the world. We've discovered that she goes crazy whenever she smells bread in the kitchen, and let me tell you, she knows when there's bread out. She can smell it from anywhere. She becomes restless and paces back and forth on the kitchen floor, her head up, nose twitching and her eyes shining, searching for the bread! So whether it's toast for our breakfast or bread for sandwiches at lunch, Granny always has to get her slice first or there won't be peace in the kitchen. A piece of bread for peace in the kitchen, you might say. So having just told you about Granny's obsession with bread, I felt a little sheepish after putting her on the couch for the photo shoot today about noon. Usually when I put her on the couch or a bed, she'll settle down and nap, but she kept trying to get off the couch, first going one way and then the other, looking for a way down. She was in constant motion, restless, and increasingly frustrated by being up there. I said to Alayne, "Jeez, she seems pretty worked up for some reason." And then -- hello, Steve! -- I realized why: Alayne was, yes, in the kitchen making sandwiches, and Granny could smell that bread! So she must have felt like I was tormenting her by making her sit on that confounded couch for some silly photos while her slice of bread was waiting in the kitchen! He's A Handsome ... What? I got this photo of Trooper yesterday afternoon on the porch at Widget's House, while I was over there taking photos of Emmy Lou and Zephyr. We kept getting requests for updates on this boy, and I've been delinquent in posting something ... so here he is! Notice it looks like nature took a perfectly good Labrador body (well, um, figuratively speaking on that "perfectly good" bit) and parked a hound dog head on it. Love those ears! Would you call him a "Labound"? Or maybe a "Houndador?" Trooper's right hip has healed just fine from the femoral head ostectomy surgery he underwent last month. You can see a slight scar from the staples they used to close the incision site. He continues to hold that leg up a tad, just like he is in the photo, because I think he was so conditioned to not being able to use the leg that he hasn't re-learned how to use it again. So when he runs -- and let me assure you, he loves to run across the yard at an incredible clip -- he just pulls it up off the ground and flies across on three legs. It is incredibly difficult to photograph or videotape a dark dog on white snow, especially in motion, but once the snow melts, I'll videotape him in action running so you can see how fast he is. His twisted front leg, despite it's odd shape, doesn't seem to bother him one bit, and so we are comfortable right now not pursuing the much more complicated and extensive surgery on that leg. Trooper always looks serious for the camera, but he is a clown at heart ... yet when the camera comes out, this goofball from Louisiana adopts this rather dour look. In reality he is a funny character, springy and bouncy and very vocal. His crate was on the east side in Widget's House, which allowed him to see the kitchen area -- so whenever any of us were there fixing up food or medications, he would stare at us and bay and bay from his crate. Having had enough of the crooning coonhound, last week Gloria switched his crate to the west side so he couldn't see the kitchen area ... and the baying stopped. Out of sight, out of bay. 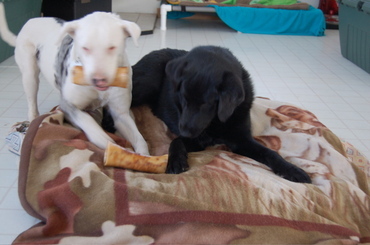 This is blind Emmy Lou on the left, about to steal a bone from her boyfriend, able-bodied Zephyr. Our employee Gloria G., who is Zephyr's mom, asked if she could adopt Emmy Lou, and we gladly said yes. 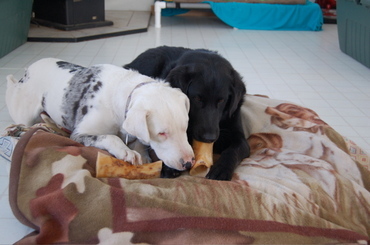 Gloria started taking her home on a trial basis, and Emmy Lou adapted so well that we made the adoption official. Soon after coming to work here last October, Gloria and Zephyr fell in love with Emmy Lou, and the two dogs would play together every chance they had. Now at the end of the day they both go home with Gloria, and then come back the next day when Gloria returns to work. When Gloria first began taking her home, Emmy Lou was very nervous about getting in the car -- but now she insists on riding up front in the passenger seat! 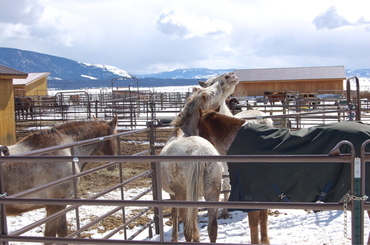 The Rolling Dog Ranch Chauffeur Service was on the road again this morning, headed to Missoula to pick up blind Penny at Missoula Veterinary Specialty Clinic. 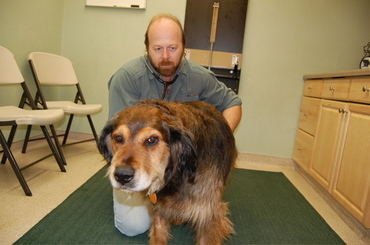 I took the photo of our internal medicine specialist, Dr. Dave Bostwick, doing a 'check-out check-up' on Miss Penny before we left the hospital. She seems a little suspicious in this photo, and I thought about titling this blog post, "What exactly are you doing back there?" Penny had come down with full-blown pneumonia, but has recovered quickly. She will need to stay on a course of antibiotics for a while, but she is a much different girl than she was just two days ago. 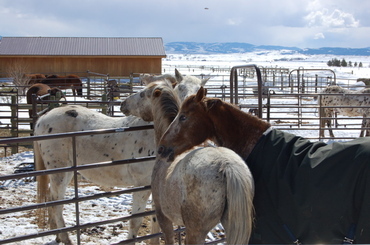 When I got back to the ranch and opened the back door of the truck, Penny almost fell out. She had fallen asleep right against the door, so when I opened it, her full weight -- about 90 pounds -- was pressing on it. I got my hands on her just in time. She was still sound asleep, and happy to stay that way, too! We had adopted Penny out last year to a wonderful family in Missoula, but after only one day with them, Penny began acting sick. She didn't want to eat, she drank constantly, she paced and was restless, and seemed totally out of sorts. Her new family called and told us they were worried something was very wrong with her. So we had them take Penny to Dave, and I asked Dave to give her a thorough medical exam, ultrasound her organs, run blood panels, and do any other diagnostics he thought were in order. Two days and a few hundred dollars later, Dave called with the results. Penny was fine. A very healthy dog. There was nothing wrong with her at all. Except ... as it turned out ... she was sick ... homesick! 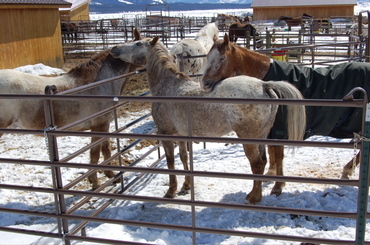 When Penny still didn't improve, Penny's adopters finally brought her out to the ranch to return her. They told us that when they turned off the highway and onto the county gravel road that leads to the ranch, Penny suddenly sat up in the back seat of their car. Then she started smiling and wagging her tail. They said that as soon as Penny realized where she was -- headed back to the ranch -- she sprang to life. She stood up in the seat the rest of the way, her tail just flipping back and forth with excitement. When Alayne went out to greet them, Penny bounded over, pressed her body against Alayne's leg and didn't let up. She was so happy to be home. Penny went right back to being her old self again. And of course, we felt guilty about having put her through this! "Mitch was abandoned in an outside kennel at our county animal control facility one cold Saturday night in January. 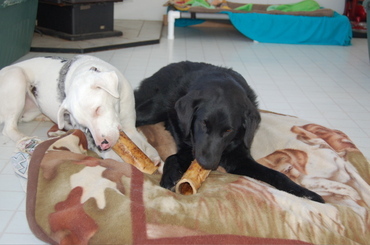 We always check the kennels on Friday, Saturday and Sunday evenings because they are closed on the weekends. When I saw him I was impressed with his sweet disposition and his good looks. I told my husband, “We have to save this dog.” We had no idea he was blind. We gave him food and water and I called animal control on Monday morning. 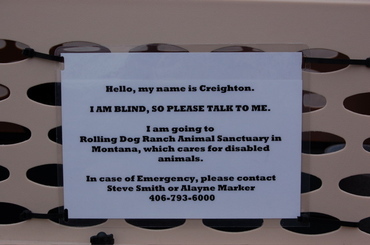 When we went to pick him up, the kennel tech informed us he had a vision problem. She brought him into the office and we could see that he was probably blind. We took him to a local vet immediately. She said he does have cataracts but they are not serious enough to blind him. She indicated his blindness could have any number of causes, but she was not able to do the diagnostics so Mitch would have to see a specialist, and would probably never see again. 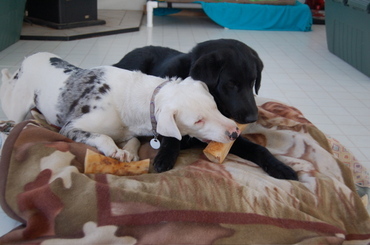 Being a small rescue in a small town the funds are simply not available for specialist care." 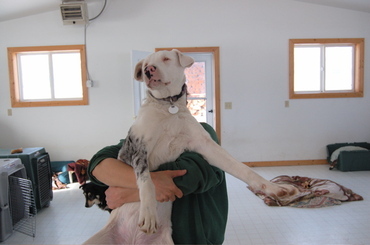 "It was my opinion that such a pretty dog with such a gentle disposition was adoptable even if he was blind. I posted pictures of Mitch and the info about him on Petfinder and other sites. To my dismay we have not received one inquiry. So this wonderful dog is living in a kennel with no constant human companionship. We try to spend time with him, but it's not enough. I think how alone and isolated he must feel. He listens to every movement around him and wags his tail at the sound of our voices or other dogs passing by him." We asked Sharon to see how he was with other dogs, and he did fine. So we agreed to take him, and I then set about making his transportation arrangements. We had to fly him into Bozeman, Montana, about three hours south of us, because Northwest Airlines is still flying larger jets -- A319s and A320s -- into that airport. 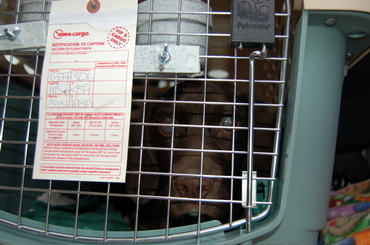 All the other airlines have switched their Montana flights to the smaller regional jets (Canadairs and Embraers), which can't take anything larger than a "large" crate ... and those are about big enough for a Cocker Spaniel. And Northwest now only flies regional jets into Missoula and Helena, too. So for a dog of Mitch's size, requiring an extra-large or giant crate, we're down to one option ... Northwest to Bozeman. Thus we made reservations for Mitch to fly from Indianapolis to Minneapolis and on to Bozeman. 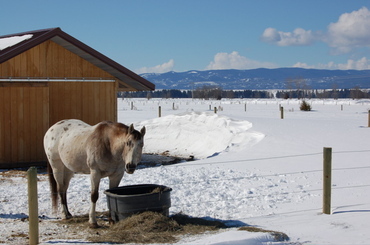 I drove down to Bozeman this afternoon to meet his 6:30 p.m. flight. When the airline personnel brought him out in his crate on a dolly, I walked over and said, "Hi, Mitch!" And this boy's tail just started a-wagging. Walking out of the terminal, Mitch went face-first into the curb, but he was so excited to be out of the crate and happy to be exploring it didn't faze him at all. We had an uneventful trip back to the ranch. 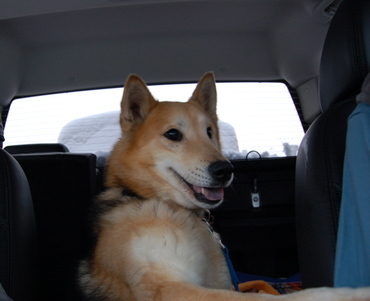 The biggest challenge was simply trying to keep Mitch in the back seat; he tried every opportunity to climb up front. He is a very sweet dog, exactly as Sharon described him. 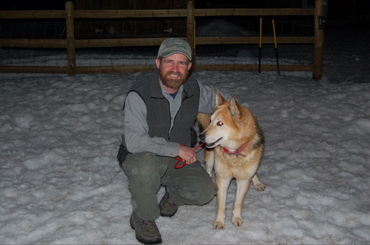 Alayne took the photo of me with Mitch right after we got home about 10:30 p.m. As I write this, Mitch is in the yard checking things out after eating some dinner. And now it's time for all of us to go to bed!